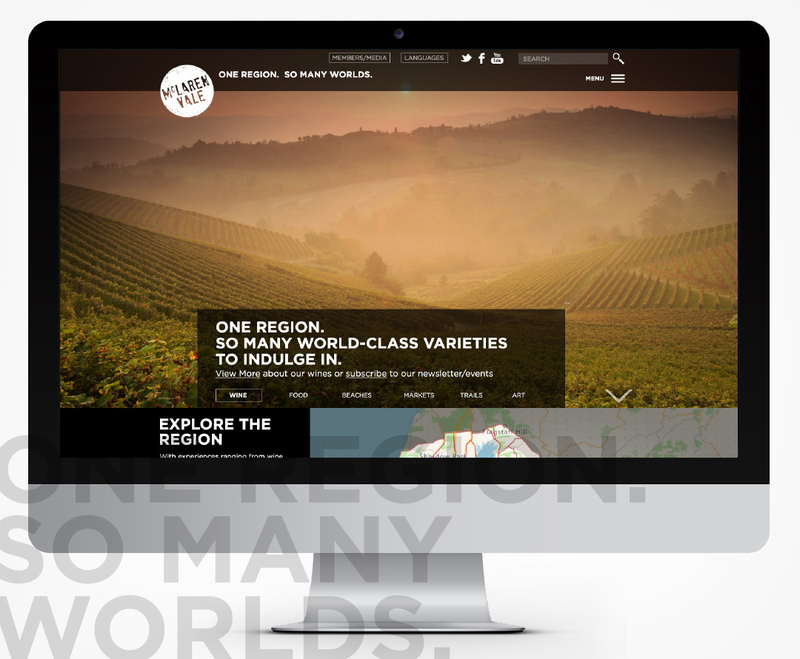 Branding and website solutions for one of the world’s leading wine regions. Visual Identity: The McLaren Vale Grape Wine and Tourism Association (MVGWTA) had a two-fold challenge: (a) raise the profile of the McLaren Vale wine region amongst local, national and international visitors (Visitation Brand), and (b) demonstrate the value it brought to its members via its Association Brand. While these two audiences are completely different, in terms of their needs and attitudes towards the MVGWTA brand, only one corporate identity was being used to communicate with both audiences. Not only did this lead to confusion amongst both audiences, it was affecting how members viewed the Association brand. Website: MVGWTA also required a Digital Communications Strategy that would deliver a range of outcomes for members, visitors and Association staff, while at the same time positioning and promoting the McLaren Vale region as one of the leading wine regions of the world. Nicknack developed a range of User Experiences for members, visitors and Association staff which would deliver these outcomes. Recommendations were also made regarding the web functionality that would deliver these experiences for all users. Visual Identity: Nicknack’s first recommendation was to separate the Association Brand from the Visitation Brand by creating a separate identity that would help the Association connect with its members. Website: A compelling and unifying digital communications strategy for brand McLaren Vale, inclusive of the development of an integrated Customer Relationship Management (CRM) platform and Computer Management System (CMS) designed to make the McLaren Vale region synonymous with the Brand i.e. McLaren Vale — One Region, One Brand. This included a separate online portal accessible only by members, trade press and select stakeholders. This would ensure that communication to members was kept separate from communication to visitors, thus demonstrating the Association’s commitment to member needs. Visual Identity: A simple and straightforward visual identity was developed for the Association Brand which placed the acronym MVGWTA (using the existing Visitation brand logotype) in a sharp, diamond-shaped form. Clean, simple, and sophisticated, the identity was used across a range of media and collateral to create a unique and distinct look for the Association Brand that was readily identifiable by members. The Visitation Website was based on a strategic design approach built around the key visitation experiences in the McLaren Vale wine region. Design your website to showcase your brand, enhance user experience, and grow traffic. Speak to us today. Let’s optimise your online communication.